'When Thunder Roars, Go Indoors' To Best Avoid Lightning's Pain : Shots - Health News Deaths in the U.S. from lightning strikes are up in 2015, compared with recent years. A convertible won't save you. Get inside at the first rumble of thunder, and stay away from plugged-in appliances. You don't have to be outdoors to be hurt or injured by a nearby lightning strike, like this one in New Mexico. The pain for survivors can be lifelong. Lightning strikes have killed at least 20 people in the U.S. so far this year, according to the National Weather Service. That's higher than the average for recent years, the service says. Most people who are injured or killed by lightning, it turns out, are not struck directly — instead, the bolt lands nearby. That's what happened to Steve Marshburn in 1969. He was working inside a bank and says lightning somehow made its way through an ungrounded speaker at the drive-through window to the stool where he was sitting. "I still have the migraines," Marshburn says. "The lightning — when it hit my back, it went up my spine, went to the left side of my brain and scorched it, came down, went out my right hand that was holding a metal teller stamp." That hand still shakes a lot, he says. Marshburn has since had 46 surgeries, and he says his back still isn't right. He started a group called Lightning Strike and Electric Shock Survivors International. The pain for those who survive a lightning injury can be so severe, he says, that some consider suicide. "Just a couple of weeks ago we talked our 27th individual out of taking their life," he says. In those phone calls, Marshburn tells lightning strike survivors that there's help available from the 1,800 or so members of his group. Dr. Mary Ann Cooper, an emergency physician who directs the lightning injury research program at University of Illinois, Chicago, says that while most people assume lightning strikes cause burns, brain injuries are more common. 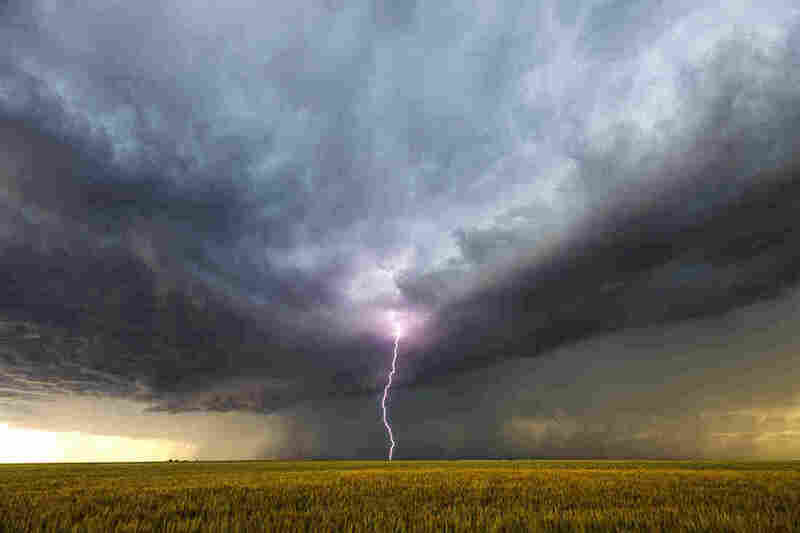 Lightning strikes can damage nerves in a way that causes nerves to misfire, sometimes for the rest of the survivor's life, she says, and the brain reads that misfiring as chronic pain. Even with the near doubling of lightning strike fatalities this year so far, the total is way down compared with the 1940s. Back then, according to the National Weather Service, a division of the National Oceanic and Atmospheric Administration, 300 to 400 people died each year. John Jensenius, a meteorologist and lightning safety specialist with the agency, says there are a few reasons for that. "Most homes had corded phones," he explains. "So a corded phone, when people held it right up to their head, was a direct connection with wires outside." And he says there were a lot more farmers sitting on uncovered tractors decades back. Today about two-thirds of fatalities happen while people are having fun instead of at work. Jensenius says people who were fishing account for more than 10 percent of the lightning deaths in the last decade. "We have a very simple saying: 'When thunder roars, go indoors.' Which means," he says, "if you hear thunder you need to be inside right away." One problem with following that advice is that many lightning injuries happen at beaches, where the loud surf can make it difficult to hear thunder. So Jensenius advises making sure you know the weather forecast before you go. If you want to know how far lightning is from you, he says, count the seconds between the flash of lightning and clap of thunder, then divide that number by 5. That's how many miles away the strike is. "In the case of a thunderstorm, lightning can strike up to 10 miles away," Jensenius says. "That would be 50 seconds and really, that's about the distance you can hear thunder. So, even a distant rumble should tell you you're close enough to be struck by lightning." And when you go inside for cover, he says, know that if lightning strikes your house it can travel along electric lines or plumbing. So don't hold on to plugged-in appliances or their cords, or take a shower until the storm is over.